The poster declares 「生活を守り抜く。」 (defend their lives), but his pose says, I love the part in Billy Madison where Billy acts out Shakespeare. 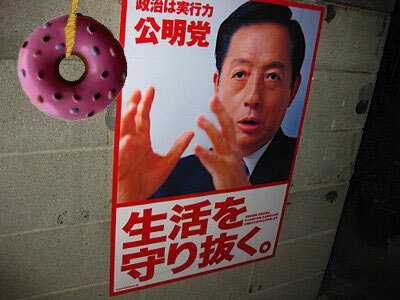 How could anyone take a man seriously when he has a poster printed that makes it look like someone is dangling a doughnut in front of him? Is he going to defend our lives from doughnuts by eating them all? One thing is for sure, I giggle every time I see this.